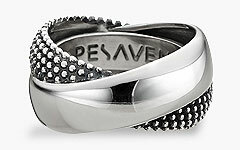 Pesavento redraws the boundaries of jewelry with innovative sterling silver designs. Since 1992 Pesavento has been creating unique designs with a signature Italian style. The rings, bracelets and earrings are made from sterling silver and the designs involve technological experimentation.These unique designs are the perfect addition to any jewelry wardrobe.